The 15th Biennial Challenger Conference for Marine Science recently took place at the University of East Anglia in Norwich, on 3-6 September 2012. There were over 100 talks, 150 posters, a contentious debate on wind power, and a talk on how the UK can maintain its current research infrastructure. Over the next week or so Words in mOcean will be bringing you a recap of the best of the action, starting with four of the keynote lectures. Today’s recap is on the lecture given by David Righton, titled ‘Fish behaving madly: How integrating oceanography and behaviour can help us think like a fish’. Enjoy! In a refreshingly light-hearted talk that included mentions of Heston Blumenthal, Delia Smith, and Rodney from ‘Only Fools and Horses’ (references that may have been lost on many non-British members of the audience), the speaker talked about the challenges of observing free-living marine organisms in their natural environment. Although difficult, the speaker showed that there was a lot to be gained from knowing the ‘what, how, when and why’ of fish behaviour, including how best to manage populations – especially under climate change. Over 50 years ago a single fish would be tagged with a transponder tag, and then followed and monitored by a single research ship (often for up to a week). This, not surprisingly, is labour intensive and hugely expensive! However, it did reveal some interesting aspects of fish behaviour, such as how vertical migration into and out of tidal currents is often used to aid migration – minimising the amount of energy that has to be expended for swimming. The speaker then talked about how modern technology (from the 60s onwards) uses archived tags: a pressure sensor attached to a timing device. These have decreased in size, from the size of a backpack to the size of a coin, allowing them to be deployed on smaller and smaller fish without affecting their behaviour (a backpack attached to a mackerel will probably result in sinking behaviour!). These tags have recently shown that cod tend to spawn in relatively cool waters around the UK: the implication being that increased water temperature around the UK may have adverse effects on our cod fishery – although other stressors may also be important (e.g. salinity, pH, prey distributions etc.). Pop-up satellite archival tags (PSATs) used to track eels. If you find one next time you’re walking along a beach, send it back. Finally, this speaker talked about something of a mystery: where do European eels go to spawn? Based on the fact that younger larvae are found towards the Sargasso Sea, it is hypothesised that adult eels migrate here to spawn. However, no adult eels have ever been observed in this location. Using pop-up satellite archival tags (PSATs), that rely on being returned after becoming washed up on beaches (see image above*), the speaker discussed how they are hoping to track the behaviour of adults back to the Sargasso Sea. So far, the tags have revealed some interesting aspects of the eels’ behaviour, including an interesting migration behaviour that is thought to delay the development of the eels’ reproductive organs (click here for more information). The speaker also told an amusing tale of a tagged eel that appeared to be making migrations down to many thousands of meters. It turns out that the researchers were observing the behaviour of a pilot whale that had gulped their tagged eel down as a light snack some days earlier. 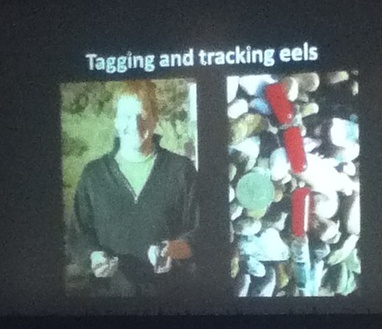 *If you see these tags, be sure to return them: the eel researchers will be very grateful!